Markets barely had a chance to catch their breath over the holiday period when the new year started off with a bang and two 600+ point swings in three days, and will face plenty of tests next week with US and China delegates meeting to discuss trade, US and European trade officials meeting, UK parliament resuming debate on the Brexit withdrawal bill, the final US CPI report of 2018, Fed Chair Powell speaking in a barrage of Fed comments which includes nine scheduled speeches by Fed officials, and topped off with FOMC meeting minutes all on the cards all while the US government shutdown extends into its 17th day. Touching on those in order, Deutsche Bank's Craig Nicol notes that on Monday a US trade delegation is meeting with officials from China in Beijing for two days of trade talks. This will be the first face-to-face meeting since Presidents Trump and Xi Jinping agreed to the 90-day truce back on December 1st. The US delegation will be led by Deputy US Trade Representative Jeffrey Gerrish and talks between the sides are expected to involve mid-level officials. It's expected that talks will focus on the protection of intellectual property and Chinese industrial policy before a potential meeting between US Trade Representative Robert Lighthizer and Chinese Vice-Premier Liu He later this month. Markets have become particularly sensitive to trade headlines again in recent weeks and while talks are expected to be more technical in nature, any sign of progress is likely to be taken positively. On the subject of trade, on Wednesday US Trade Representative Robert Lighthizer is due to meet EU Trade Commissioner Cecilia Malmstrom in Washington to discuss bilateral trade liberalization. It's also expected that both will meet with Japan's Trade and Industry Minister Hiroshige Seko on the subject of trade practices by China. So something to also potentially watch. Staying with politics, Wednesday is also the day that UK Parliament is due to resume debating the Brexit Withdrawal Bill. A reminder that a vote on the Bill is likely due during the week of January 14th. PM May had previously said that she would be pushing the EU27 for further clarifications before Christmas however it appears that this hasn't materialized, which means MPs will be debating the current deal as it stands. Meanwhile, the big data highlight next week is the December US CPI report on Friday. The consensus for the core, as it typically always is, is for a +0.2% mom reading which would likely be enough to hold the annual reading at +2.2% yoy and therefore likely to please the Fed by and large. The headline should be impacted by falling oil prices, hence the -0.1% mom consensus. Also worth flagging next week is a scheduled speech by Fed Chair Powell on Thursday to the Economic Club of Washington DC. The content of that speech may well depend on what we hear from the Chair this afternoon. On a similar note next Wednesday's FOMC meeting minutes from the December 18-19 meeting will be closely watched. A reminder that the post-meeting statement, the dots and the press conference combined came across as a relatively balanced step in a more dovish direction for the Fed, but less so than the market was expecting. As we know data since then has been soft, market volatility has picked up and the market has moved to price in Fed rate cuts in 2019. So it'll be interesting to see if the minutes and Powell change this view at all. As for other things to keep an eye on next week, it's actually a packed week for Fedspeak. Today, Bostic will then speak in Atalanta, before he speaks again on Wednesday on the topic of the economic outlook. Also speaking on Wednesday will be Evans and Rosengren, also both on the topic of the economic outlook. Barkin, Bullard, Evans and Clarida are then due to speak at various stages on Thursday. So we should have a decent idea of what the Fed is thinking by the end of next week. As for data in the US, we'll also get final November factory orders, durable and capital goods orders on Monday along with the December ISM nonmanufacturing reading, before we get the November trade balance and JOLTS report on Tuesday, claims on Wednesday and December monthly budget statement on Friday. The highlight of a comparatively quieter European calendar is November industrial production readings in Germany (Tuesday), France (Thursday) and the UK (Friday). In China we're due to get the December CPI and PPI prints on Thursday. Finally, other things worth keeping an eye on next week include the ECB's Guindos speaking on Monday, World Bank releasing its latest global growth forecasts on Tuesday, BoE's Carney speak on Wednesday, BoJ Governor Kuroda speaking on Thursday, ECB minutes released on Thursday and ECB's Mersch, Nowotny and Makuch speaking on Friday. Monday: Trade is likely to dominate the early focus next week with a US delegation visiting China for two days of trade talks with officials. Meanwhile, it's a busy start to the week for data on Monday with Japan's December composite and services PMIs out overnight, followed by.Germany's November factory orders, UK December new car registrations and the Euro Area's January Sentix investor confidence and November retail sales data. In the US we'll get final November factory orders, durable and capital good orders along with the December ISM non-manufacturing index. We will also get China's December foreign reserves data at some point during the day. Away from that, the Fed's Bostic is due to speak in the afternoon, while the ECB's Guindos is also slated to speak. Tuesday: In terms of data releases on Tuesday, overnight we get Japan's December consumer confidence print while in Europe we get Germany's November industrial production report, France's November trade balance and current account balance data, UK's December Halifax house prices data and confidence indicators for the Euro Area. In the US we'll get the December NFIB small business optimism reading and November trade balance, JOLTS jo openings and consumer credit data. Also of note, the World Bank will publish its updated Global Economic Prospects report, with forecasts for global growth. 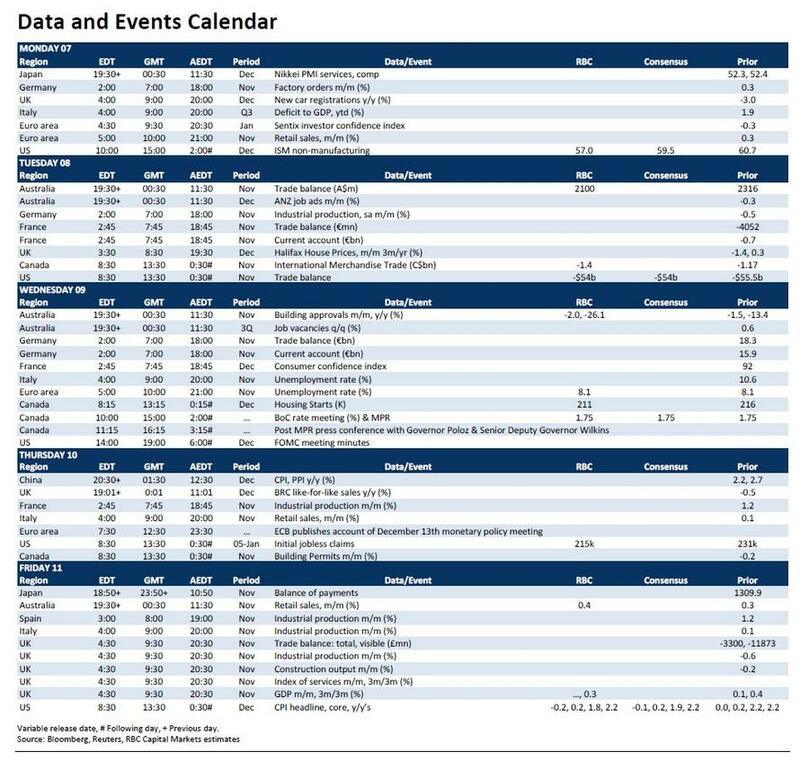 Wednesday: The main highlight on Wednesday is the FOMC minutes from the December 18/19 meeting. Away from that it's a quiet day for data with Japan cash earnings, Germany's November trade balance and current account balance, France's December consumer confidence, Euro Area unemployment rate and MBA mortgage applications data in the US the only releases due. It's a busier day for Fedspeak however with Bostic, Evans and Rosengren all due to speak in the afternoon while the BoE's Carney is also due to speak. Also worth flagging is UK Parliament resuming debate on the Brexit withdrawal bill, while US Trade Representative Lighthizer and EU Trade Commissioner Malmstrom will discuss bilateral trade liberalization. Both will also meet with Japan’s Trade and Industry Minister Seko. Thursday: Fedspeak should dominate market focus on Thursday with Fed Chair Powell and committee member's Clardia, Barkin, Bullard and Evans all due to speak at different times during the day. In terms of data, overnight we get China's December CPI and PPI. In Europe we'll get France's November industrial and manufacturing production data along with the minutes of the ECB's December monetary policy meeting. In the US we'll get the latest weekly initial jobless and continuing claims data along with November wholesale inventories and trade sales. The ECB's Villeroy is also due to speak in the afternoon. Friday: The big highlight on Friday is the December CPI report in the US. Prior to that, we'll also get the UK's November trade balance, industrial and manufacturing production, construction output and monthly November GDP data. The only other release of note in the US is the December monthly budget statement. Finally, the ECB’s Mersch, Nowotny and Makuch are due to speak at a conference. Finally, looking at just the US, Goldman notes that the key economic data releases this week are the ISM non-manufacturing report on Monday and the CPI report on Friday. In addition, minutes from the December FOMC meeting will be released on Wednesday. There are several scheduled speaking engagements by Fed officials this week, including one by Chairman Powell and one by Vice Chairman Clarida on Thursday. The factory orders report on Monday and the trade balance report on Tuesday will be postponed if the federal government is still partially shut down. The advance goods trade balance, wholesale and retail inventories, new home sales, and construction spending reports, which were not released in prior weeks, may be released if the federal government reopens. 10:00 AM Factory Orders, November (GS -0.5%, consensus +0.3%, last -2.1%); Durable goods orders, November final (last +0.8%); Durable goods orders ex-transportation, November final (last -0.3%); Core capital goods orders, November final (last -0.6%); Core capital goods shipments, November final (last -0.1%): Postponed if partial government shutdown still in effect. 10:00 AM ISM non-manufacturing index, December (GS 58.0, consensus 59.0, last 60.7): Our non-manufacturing survey tracker decreased by 2.9pt to 54.2 in December, following broad-based declines in regional service sector surveys. The tracker remains 6.5pt below the November reading of the ISM non-manufacturing index, and indicates that there may be some “catch-down.” Weak stock market performance and lower business confidence are also likely to weigh on the index. We expect the ISM non-manufacturing index to move down by 2.7pt to 58.0 in the December report. 12:40 PM Atlanta Fed President Bostic (FOMC non-voter) speaks: Atlanta Fed President Raphael Bostic will speak to the Rotary Club of Atlanta. Audience Q&A is expected. 08:30 AM Trade balance, November (GS -$54.5bn, consensus -$54.0bn, last -$55.5bn): Postponed if partial government shutdown still in effect. 08:20 AM Atlanta Fed President Bostic (FOMC non-voter) speaks: Atlanta Fed President Raphael Bostic will speak to the Chattanooga Chamber of Commerce at their 2019 Economic Outlook Breakfast. Prepared text and audience Q&A are expected. 09:00 AM Chicago Fed President Evans (FOMC voter) speaks: Chicago Fed President Charles Evans will discuss the economy and monetary policy at a Discover Financial Services company meeting in Riverwoods, Illinois. Prepared text and audience Q&A are expected. 11:30 AM Boston Fed President Rosengren (FOMC voter) speaks: Boston Fed President Eric Rosengren will give a speech on the economic outlook to the Boston Economic Club. Prepared text is expected. 2:00 PM Minutes from the December 10–11 FOMC meeting: At its December meeting, the FOMC raised the target range for the policy rate by 25bp to 2.25-2.50%, as widely expected. The median projection for rate hikes over 2019-2021 also fell to a 2-1-0 baseline from 3-1-0 in September. In the post-meeting press conference, Chairman Powell attributed the shift largely to the tightening in financial conditions and softer-than-expected inflation numbers. In the minutes, we will look for further discussion of financial conditions and the stock market selloff, and the path of the policy rate. 08:30 AM Initial jobless claims, week ended January 5 (GS 225k, consensus 225k, last 231k): Continuing jobless claims, week ended December 29 (consensus 1,700k last 1,740k): We estimate jobless claims declined by 6k to 225k in the week ended January 5, following a 10k increase in the prior week. We expect energy-sector layoffs to boost jobless claims in upcoming reports, and the underlying trend may be picking up at the margin in other sectors as well. 08:35 AM Richmond Fed President Barkin (FOMC non-voter) speaks: Richmond Fed President Thomas Barkin will give a speech on ensuring long-term growth at a Raleigh Chamber of Commerce breakfast in Raleigh, North Carolina. Prepared text and audience and media Q&A are expected. 10:00 AM Wholesale inventories, November final (preliminary not yet released): Postponed if partial government shutdown still in effect. 12:00 PM Fed Chairman Powell (FOMC voter) speaks: Fed Chairman Jerome Powell will give a speech at the Economic Club of Washington. 12:30 PM St. Louis Fed President Bullard (FOMC voter) speaks: St. Louis Fed President James Bullard will speak on the economy and monetary policy to the Little Rock Chamber of Commerce. Prepared text and audience and media Q&A are expected. 1:00 PM Chicago Fed President Evans (FOMC voter) speaks: Chicago Fed President Charles Evans will discuss the economy and monetary policy at a Milwaukee Business Journal Economic Forecast event. Prepared text and audience and media Q&A are expected. 5:30 PM Fed Vice Chairman Clarida (FOMC voter) speaks: Fed Vice Chairman Richard Clarida will speak to the Money Marketeers of NYU. 8:30 AM CPI (mom), December (GS -0.11%, consensus -0.1%, last +0.02%); Core CPI (mom), December (GS +0.16%, consensus +0.2%, last +0.21%); CPI (yoy), December (GS +1.86%, consensus +1.9%, last +2.21%); Core CPI (yoy), December (GS +2.13%, consensus +2.2%, last +2.24%): We estimate a 0.16% increase in December core CPI (mom sa), which would bring the year-over-year rate down one tenth to +2.1%. Our forecast reflects negative residual seasonality in household goods, lower oil prices to weigh on airfares, and mild weather and Sears closures to weigh on apparel, while we expect likely firm spring tuition increases. We look for a 0.11% decrease in headline CPI (mom sa), reflecting a drag from lower gasoline prices.